Elise was the daughter of Rudolph Schiff and his wife Maria Anna Josepha Kunkel. I believe she was born at Bruchsal in August 1871, the third of four children, her siblings being Mathilde, Otto the composer, and Franz Salomon, who has left many descendants. 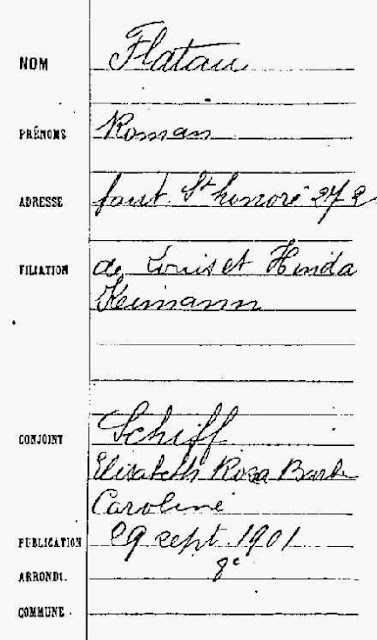 The records state she was born on August 16th, but her Polish residence permit gaves the date as August 19th. She married Roman Flatau in Paris in the autumn of 1901. 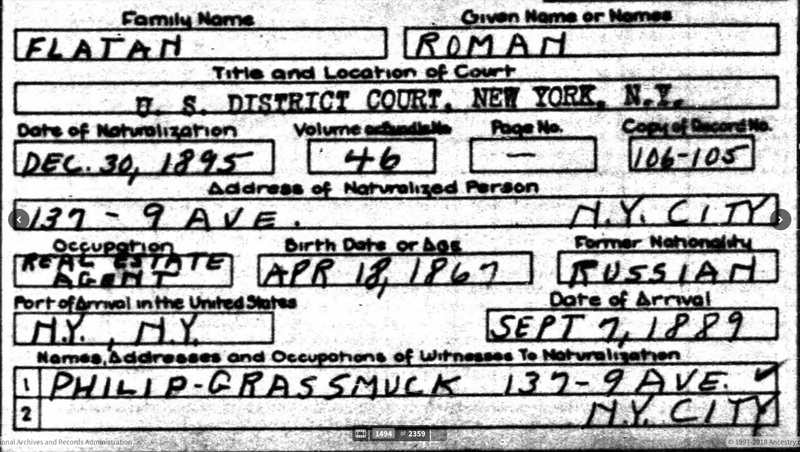 Roman was born in Plock, north west of Warsaw, and close to Poznan (then Posen in Prussia) on April 18th 1867. They presumably went to live in Poland after their marriage, but to what had been a German-speaking part of the country. Marriage Banns for Roman and Elise. Roman's mother was in fact Anna (Yiddish Hinde) Heyman. Keimann seems to be a misreading. I have so far been unable to trace if they had any children, though I know that Roman was trained as a lawyer, and thus was given the title Doctor, and was buried in 1933 at Taverny in the north-west suburbs of Paris. He came from an illustrious family, his father being a wealthy banker and philanthropist. His brother Edward was a very famous neurologist, and his brother Julian was a renowned chemist and pharmacist, and professor at Poznan university. There was also a sister Helena. Edward remained Jewish throughout his life, Julian became a Protestant, and Roman and his wife are recorded as being Roman Catholic. Their father Ludwik remained Jewish though strongly supporting assimilation. Bruchsal, her birthplace not far from Mannheim, was where Elise's great aunt Hange Maier lived, and where her great grandmother Augusta Schiff had gone to live on the death of her husband Samuel in 1827, until her own death in 1845. I have not been able so far to trace any other information about Elise, such as details of her death. "The documents are complemented by photo plates and glass plates from 1935-1958 and other materials, among which one deserves particular attention: anonymous denunciations for Aleksandra Flatau, and a 30-year contract for extending the validity of the tomb of her uncle Roman Flatau, issued to her by the mayor of Taverny in France in 1959." 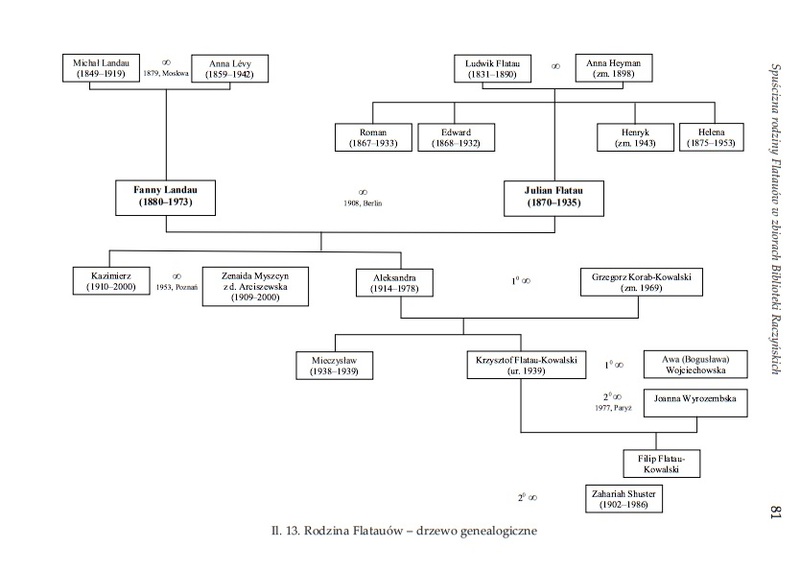 This is an important and valuable essay in Polish about the Flatau family. These documents appear to refer to Roman Flatau but need some analysis and explanation. Poznan was part of Germany until the end of the First World War, when it returned to Poland after over a hundred years. It is possible that this is a different Roman Flatau but it seems unlikely. Roman's birthplace was Plock, which was indeed part of Russia until it was returned to the new state of Poland after the First World War. 1894. Christina Freer had no connection with Roman: her occupation was 'wife'. She would have been travelling to join her husband in America. in Rabka on February 8, 1943. In the mortgage book of Osada Anitra there are two men named Flatau - Julian and Henryk. We decided to follow them, finding the entire scientific dynasty among the representatives of whom both Julian and Henryk appear. Are these the same Flatau, who were immortalized in the mortgage registers of Letniska Milanówek, unfortunately it remains a puzzle for now, although circumstantial evidence indicates that it may be about them. Professor of chemistry Julian Flatau was born in 1870 in Płock or Warsaw. He gained a very careful education, he studied, among others in Berlin, Vienna and Zurich. After graduation he worked in Bern and the Sorbonne in Paris, and then in Warsaw, where he collaborated with the paint factory. In 1914 he left Warsaw, going to Moscow. After World War I, he moves to Bydgoszcz, and then to Poznań, where he is the head of the Department of Medical Technology at the University of Poznań. He has not returned to Warsaw. Can it be Julian, whom we are looking for? Possibly. During his stay in Warsaw, he was able to purchase a property in nearby Letnicka Milanówek. However, we decided to look for Mr. Flatau more connected with Warsaw. Here, after a short search, it was possible to record success. A resident of Warsaw was a famous physician, one of the founders of the foundations of modern neurology Edward Flatau. He was born in 1868 in Płock, where his family was one of the most significant for the city (the palace remained after them, currently serving as a wedding palace). Edward Flatou was educated in Berlin and Moscow. At just 26 years old, he published a brain atlas that gained international recognition. Sigmund Freud himself was to say that the photos contained in the atlas are a great educational material. In 1899 Edward Flatau rejected the proposal to take the neurology department in Buenos Aires and lived in Warsaw, dealing with, among others, spinal cord research and discovery of the Flatau law. Considering that there were many scientists in the then Letniska Milanówek, it can not be ruled out that Edward Flatau also visited here, visiting another representative of the Flatau family, Henryk, who owned a villa here. Only who was Henry? Here the search turned out to be much more difficult than in the case of Edward. The mystery was only explained by the article by Stanisława Mysłakowska "Borowin during the occupation", placed in the Podkowia Cultural Warehouse. It is written there that during the Second World War a widow of dr. Hid in Podkowa Leśna. Edward Flatau, whose daughter left the hideout in Podkowa to join Uncle Henryk, who lives in Rabka. So Henry Flatau was the brother of Edward Flatau. For a deeper search it turned out that he was also a doctor, although much less known than his famous brother. Were the flatau men in question really connected to the pre-war Milanówek? In the picture placed on Wikipedia in the biography of Joanna Flatau, daughter of Edward Flatau, there is a picture of her childhood signed "presumably in Konstancin". Maybe this is not Konstancin at all? Or maybe it is in the pre-war Milanówek that one should look for completely different men of Flatau. "The national parcel bank for the Kingdom of Poland. 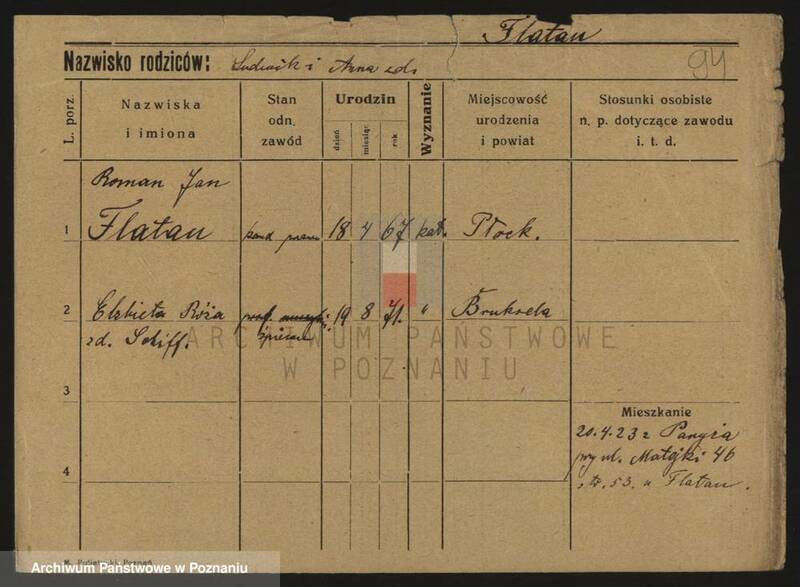 We have before us the act of the national parcel bank established in Warsaw for the Kingdom of Poland, headed by two thoroughly acquainted with this activity, the citizens of Płock land, pp. Henryk Flatau and Antoni? Kowalewski. The bank is assumed to be a parent company with broad financial support. It aims, among other things, to defend against buying land in the Kingdom of Poland by the Germans and to facilitate the transfer of landed estates into small hands." "A photograph of the Flatau family inside the orangery located on the property in the 1880s. 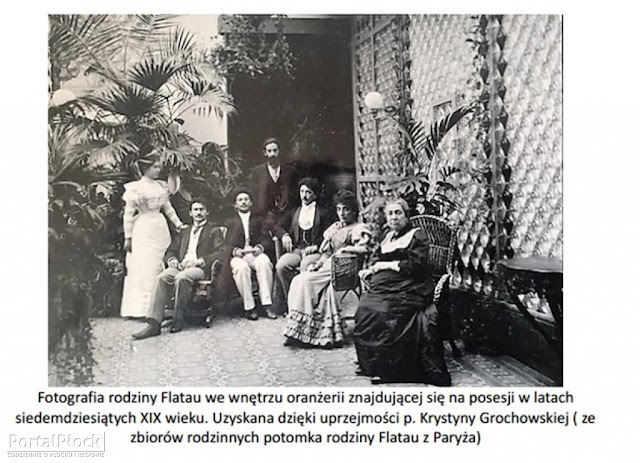 Obtained thanks to Ms. Krystyna Grochowska (from the family descendants of the Flatau family from Paris)"
Ludwik Flatau - a merchant, later he became a member of the landed gentry, founder of the Flatau Jewish Old People’s Home; the chief representative of the Płock circle of assimilationists. 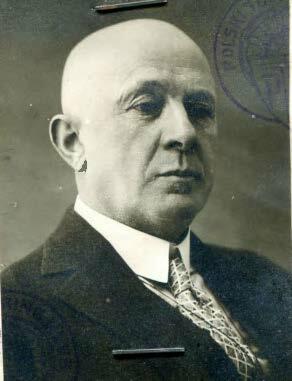 Edward Flatau (1866-1932) – Ludwik’s son, a doctor, scientist, one of the most prominent Polish psychiatrists, a co-creator of the Polish School of Neurology. His wife was Anna Flatau née Heyman (died on July 4, 1898 in Płock ), with whom he had five children: Roman, Edward, Julian, Henryk, and daughter Helena. He lived with his family on Kolegialna street at number 11  . Ludwik and Anna were the owners of the city of Bieżuń  in the years 1875-1876. He belonged to the Enlightenment movement, which assumed the spreading of knowledge and education among Jews, including Płock . The plot of May 28, 1820, he bought Bartłomiej Turski from Teodor Dohman for 12 thousand. 150 Polish zlotys. From Turski, the plot was taken over by Kazimierz Turski in 1832 for 12,000. Polish zlotys and it was his hands that became the property of the Flatau family. Turski gained 13.5 thousand on the transaction Polish zlotys. It is known that in 1835 Joachim Flaau's estate consisted of an empty square intended for residential development, and before there was a small fruit garden and a large vegetable garden. When his first wife died, her husbandthe man remarried and bought "property at ul. Collegial under number 321 ". - Joachim as a Jew, so that he could buy real property located outside the Jewish quarter, he had to turn to the Provincial Commission for a purchase permit. In 1865, Berta Flatau, using her husband's illness, sold the right of perpetual rent to the garden to Stanisław Kirkor, an economic cashier who re-sold them the following year to Abraham Herman from Kalisz. This coincides with the death of Joachim Flatau, who left nine children, which led to the stratification of sentences regarding the future use of the inheritance. The sisters preferred to sell it and divide the income, while Ludwik, born in 1835, a merchant and banker, supported his mother, who stood for public auction. Ultimately, the property is managed by a son who also becomes its owner. 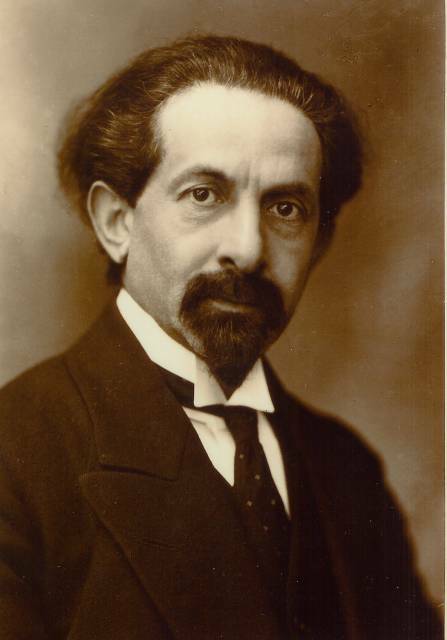 The article presents the life and activity of individual members of the intellectual family of Flatau, Jewish origin, from 1921 related to Poznań. They include: Julian Flatau (1870-1935) - professor of chemistry at the Poznań University and the Poznań School of Economics, his wife Fanny nee Landau (1880-1973) - lawyer, translator and private foreign language teacher by education, their son Kazimierz (1910-2000) - a chemist by education, lecturer in physics at the University of Poznań and creator of the harpsichord class at the State Higher School of Music in Poznań, daughter of Aleksander (Kowalska, Shuster 1914-1978) - lawyer and her son Krzysztof Flatau-Kowalski (born in 1938) ) - electronics engineer, parents Fanny: Anna née Lévy (1858-1942) and Michał (1848-1919) Landauowie and Zenaida Myszcyn-Flatau (1909-2000) - wife of Kazimierz Flatau. The purpose of the article is to describe primarily the contents of the family's legacy kept in the collection of the Raczyński Library in Poznań: personal documents, property, photographs, correspondence and other materials related to their interests and professional activities. They can be a valuable source material for researchers of Jewish history in Poland and their role in Poznań's science and culture. At the end of the text, a separate attention was paid to the papers of the Russian aristocratic Korostow family, who were associated with them, but the contents of the article were signaled only because of the limited volume of the article. They can be a valuable material to the history of so-called white Russian emigration after 1917.The legacy of the Flatau family in the collection of the Raczyński Library (PDF Download Available). Available from: https://www.researchgate.net/publication/276155542_Spuscizna_rodzin_Flatauow_w_zbiorach_Liblioteki_Raczynskich [accessed Mar 10 2018].